Outbound tourism from China is to swamp the world by 2019 with a wave of 174 million Chinese with $264 billion to spend on overseas shopping, according to a report from Bank of America Merrill Lynch. Some 174 million Chinese tourists are expected to spend $264 billion by 2019 in comparison with the 109 million who spent $164 billion in 2014, according to new analysis by Bank of America Merrill Lynch, Bloomberg reports. In 2014, the number of Chinese tourists traveling abroad increased by 19.5 percent year-on-year to 109 million compared to some 10 million Chinese tourists in 2000. Last year Chinese tourists spent over $163 billion on overseas shopping, according to estimates by the China Tourism Academy. 25-34-year olds will make up 35 percent of the total number of tourists, with 15-24-year olds accounting for around 27 percent, the Bank of America’s report says. 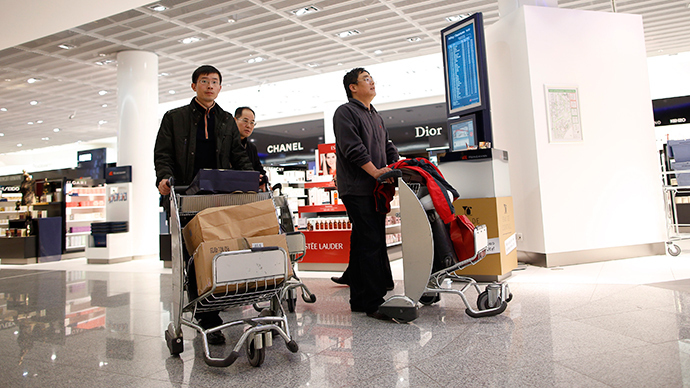 Chinese tourists are known as the world’s biggest consumers of luxury goods. Sales to Chinese tourists in designer outlets of Europe soared by more than 35 percent in 2014 and have more than quadrupled over the past four years. China has been the world’s largest outbound tourism market since 2012, according to data from the United Nations World Tourism Organization (UNWTO). In 2013 tourists from China spent $129 billion abroad, more than any other market in the world. The average expenditure of a Chinese tourist in Germany was $640, which is the highest of all the destinations. "Now the whole European industry is paying greater attention to Chinese tourists' shopping habits and consumption," Yu Jin, chief operations officer of Caissa Touristic Group AG in Hamburg told the China Daily. A favorable visa environment and more supportive policies along with information technology are boosting growth of Chinese tourism. "The prospect of China outbound tourism is bright," the director of the China Cultural Center in Berlin Shi Xiang said during the International Tourism Trade Fair. That would benefit not only economies in destination countries, but also mutual understanding, and cultural exchanges, she added.